This post has a surprise ending, a surprise even to me! As usual, I’ll just tell the story with pictures. I found this charcoal T-shirt at the thrift store two blocks from home. All clothes were half price, except for yellow tags. It had a yellow tag, but I embraced the “find” and spent the full $2.30. It was, after all, in perfect condition, a size men’s 3XXX, and had no side seams. Lately I’ve made a project of turning all of my neck scarves into “infinity” scarves, sewing the ends together with invisible seams. It takes so little to make me happy. But my favorite infinity scarves are made from extra-large T-shirts. 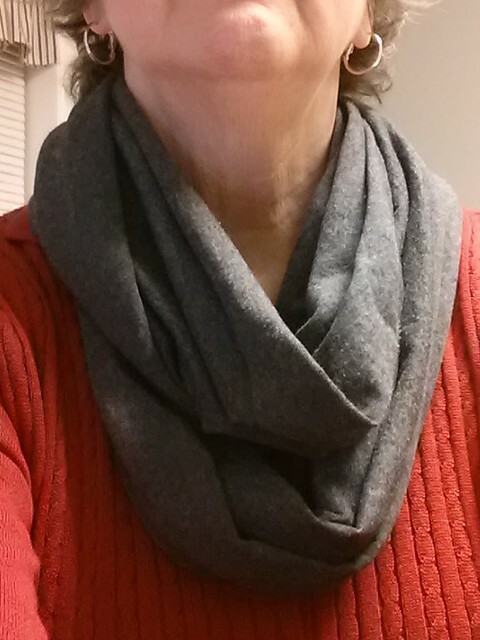 And up until two days ago I didn’t have one the color of charcoal, which would surely complete my scarf needs. 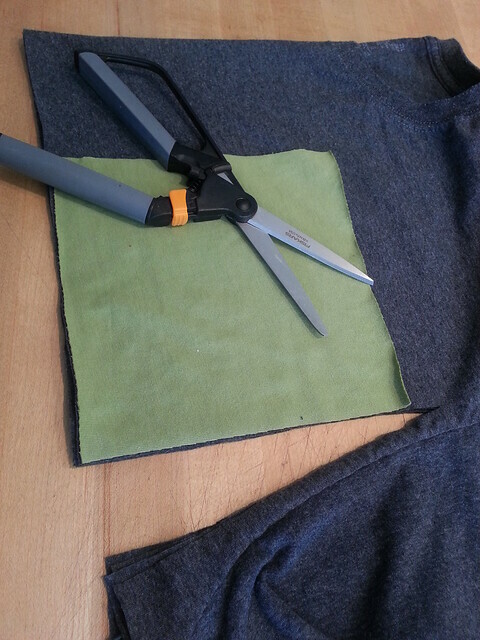 In that first picture you noticed I had already cut off the bottom hem. 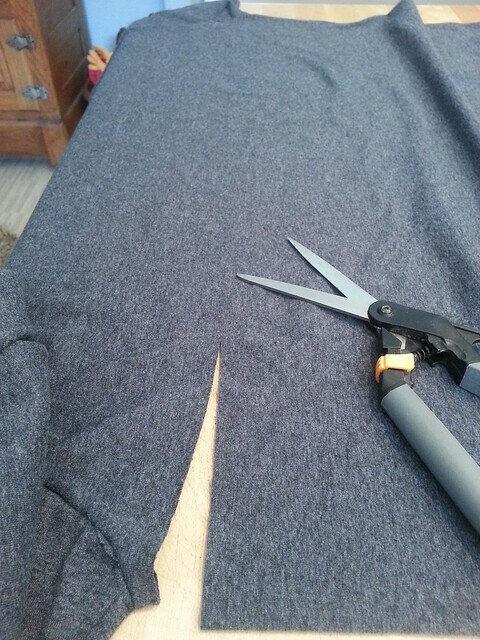 And in this picture I’m cutting it straight across just under the sleeve seams. And that’s the entire infinity-scarf tutorial. Cut/cut. Wrap around your head twice and you’re good to go. Most women my age aren’t that eager to have our necks photographed. So be a friend and don’t look at that part of the picture. I might fall over backward if I raise my chin any higher. 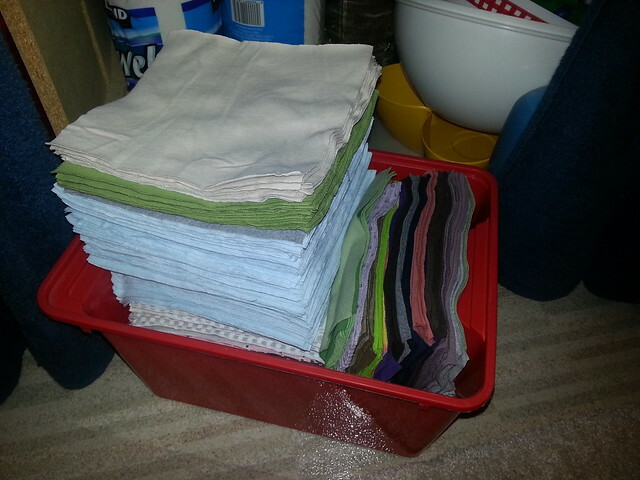 Not wanting to waste anything, I started appropriately folding the remaining fabric to cut squares for “reuseableslashdisposable” rags or baby wipes. 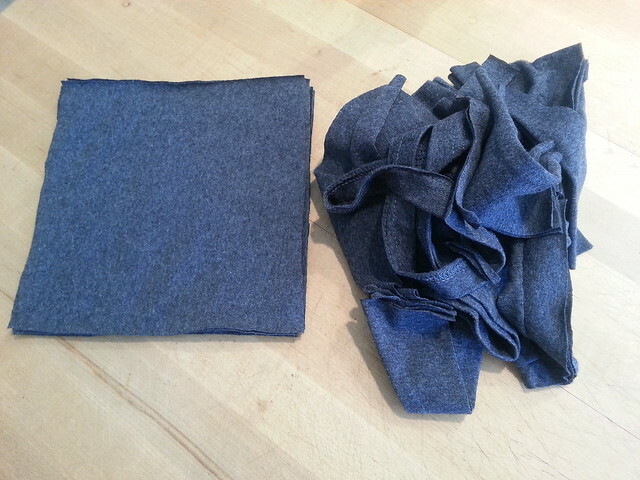 Since I don’t have a baby, I stick to the first purpose—rags that can be used multiple times then tossed without guilt. 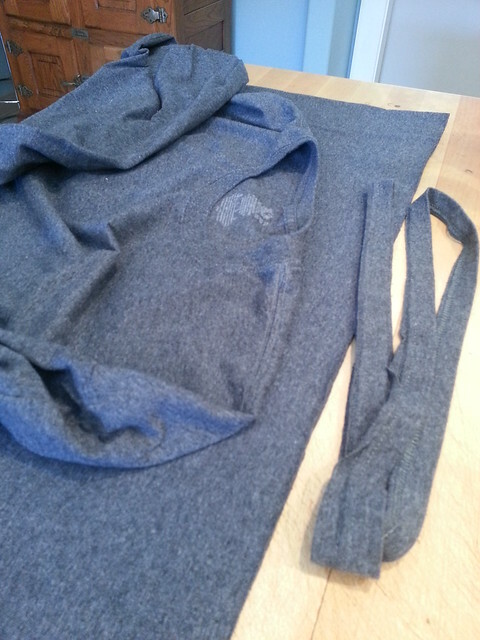 Cutting from the sleeves too, I ended up with 12 rags and only a handful of scrap. Not bad, huh? You can see I’ve been doing this for a while now. Wow! More! I’m prepared for a lot of dirt! And here’s the surprise ending. Just about an hour ago I was catching up on Frugal Living NW and I came upon this. Really, you don’t want to pass up this link. 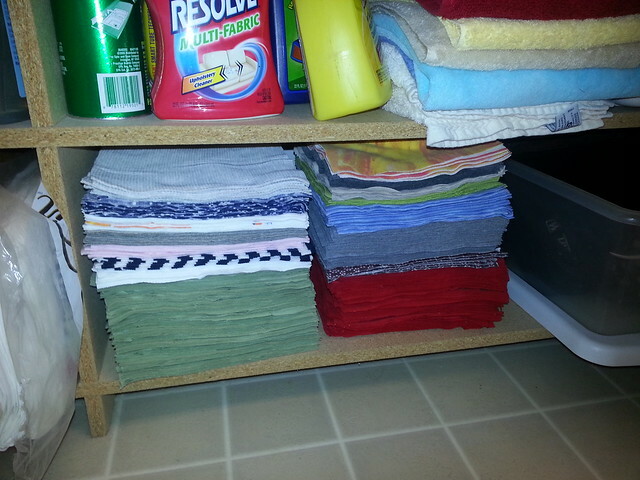 I don’t think this Macy household with be converting any time soon, even though I have inadvertently prepared for it. We will continue to enjoy the rolled kind that disappears nicely with each flush.